Interview: Takashi Murakami Discusses His New Death-Themed Art Exhibition and His Film Trilogy "Jellyfish Eyes"
Takashi Murakami&apos;s long, thrilling career in the art world has seen him exhibit globally, with important, acclaimed commissions beyond museums and galleries, as well. Whether designing a collection for Louis Vuitton in 2002, installing pieces in the Palace of Versailles in 2010, or taking over the Palazzo Reale in Milan last August, his projects have earned him a reputation for blending high art and commercialism, classical techniques and new technologies, and past and present Japanese culture. Within the music world, he&apos;s done notable collaborations with Kanye West, for his Graduation album art, and Pharrell, on a $2 million sculpture with Jacob the Jeweler, which debuted at Art Basel Miami Beach in 2009. He recently animated Pharrell for a remix video tied to his first full-length film, Jellyfish Eyes, which toured the U.S. earlier this year. Although a global release is still pending, Takashi&apos;s already completed the second film in the Jellyfish Eyes trilogy, which in total explores themes of post-Fukushima Japan, and is equally inspired by the films Murakami watched as a child. He grew up seeing a blend of post-World War II Japanese television and sci-fi films, which undoubtedly manifests itself in Jellyfish Eyes and the "superflat" art he&apos;s created since the &apos;90s. For a new exhibition at Gagosian Gallery&apos;s 24th Street Chelsea location, which runs through January 17, 2015, Murakami expands on the dark themes that have been underneath the surface of his colorful pop art all along. Titled ​"In the Land of the Dead, Stepping on the Tail of a Rainbow," the exhibition is meant to imply a contemporary belief system, "constructed in the wake of disaster, that merges earlier faiths, myths, and images into a syncretic spirituality of the artist&apos;s imagination." 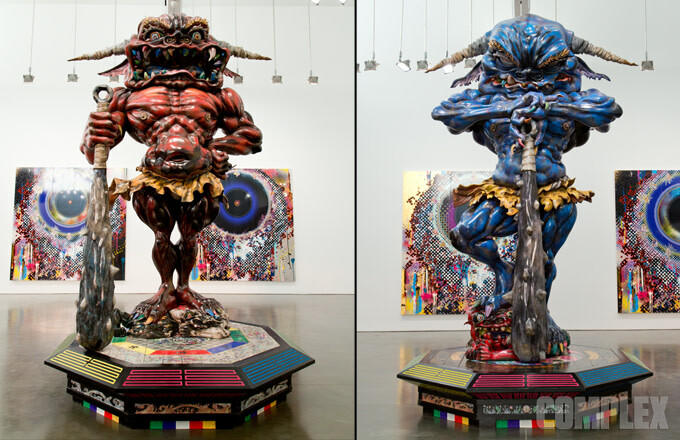 Murakami has installed a giant replica of a temple, Bakuramon, that viewers can walk through, in addition to totemic sculptures representing demons (Embodiment of "A" and Embodiment of "Um"), spray painted canvases with the words "HOLLOW" and "DEATH HATE I," a reflective sculpture of himself (Invoking the Vitality of a Universe Beyond Imagination), and many more complex paintings depicting arhats, his fictional creature Mr. Dob, and this "land of the dead." In true Murakami fashion, he thanks his team of helpers—many of them work for his company Kaikai Kiki—at the beginning of the exhibition. He&apos;s not only brilliant and eccentric, he&apos;s part of a generation of artists who willingly admit to and are grateful for those who make the scale and reach of their work possible. In our interview with him, we ask about his new exhibition at Gagosian, and his film Jellyfish Eyes, all while learning about the parallels between these projects and the ones he&apos;ll show us soon. Has your view of religion changed while creating this exhibition? It’s not that my religious view or spirituality has changed, because my religious view to begin with is an immature mish-mash of beliefs in sci-fi, UFOs, Atlantis, and things like that. But after the earthquake and tsunami natural disasters, I realized that people—in order to get away from such realities—do need religion and stories. So with that in mind, I am now creating stories and characters for pieces. 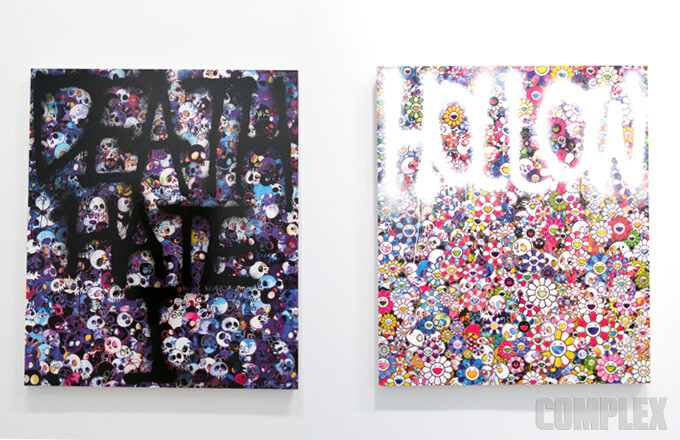 Why have you chosen to put graffiti of words like “Hollow” on your more recognizable pieces? The main piece, the temple Bakuramon​, which is the gate over there; it’s symbolic but empty. It’s just a form, because it’s devoid of all the actual meaning that used to be. It’s modeled after something, after something, after something in the whole long history of that gate. So in that sense, you’re going through a symbolic and not substantial gate, into this world that I am creating—this art world. It’s like going into the hollow, there’s only a shape, only a frame, and then inside it’s hollow. That relates to the graffiti message and concept I’m creating now. Is that also related to the other graffiti-written phrase, “Death Hate I”? Actually, that one was different. When I had dinner with Larry [Gagosian], he once said, “I hate death!” It was when some of his friends were passing away, maybe after Cy Twombly passed away. That strong statement really remained with me, so I switched around the grammar and made it into a piece. You’ve always combined classical techniques with new technologies to create your pieces and a dialogue between old and new. Which new technologies did you use for the pieces in this exhibition? I’ve used the new technologies of digital scanning and printing, and then tweaking everything on the computer. Without this technology, this show probably wouldn’t have been completed, especially the two demon sculptures. We wouldn’t have had time. The fabricators make all the details by hand, but since I have this digital printing and scanning technology, I can also make a lot of tweaking on the screen. The technology makes it simple. I’m curious about your new costume. Why have you put it on today, and who made it? I’ve been making this kind of creature for 3 years. I asked my friend, Kazuki Yunoki, who is the designer, if he could make this. And then I wanted to wear it for the opening. Speaking of the characters in your work—during Art Basel Hong Kong last year, you said, “The art world is filled with zombies." I think certain people online were confused by what you meant. It&apos;s very difficult to really articulate this, but a very good example is that, in L.A., I screened the Jellyfish Eyes film at the old United Artists Theatre, the theater at the Ace Hotel. That whole stretch of the city used to have these elaborate cinemas. There was a golden age for film, when there were tons of films, and many theaters sprang up on that street. The current situation in the art world seems a little bit similar. Around the world, museums are springing up very quickly, especially in China. I heard that around 100 museums will go up each year. So in the near future, people will probably get fed up with going to museums and looking at art. The moment will come, and I can see that coming in the near future. When people move on to a new type of entertainment or other creative activities, then the art world will essentially be filled with, basically, dead bodies. In anticipation of that right now, the art world is filled with people who are not yet dead, but almost dead. In that sense, I used the term zombie as something very apt to describe that. The art world has sped up too much, and we&apos;re heading that way, but we also don&apos;t really grasp that it’s happening. Including myself, I think the whole art world is filled with people in that zombie state. In the near future, I want to do a show with the theme of zombie, and I’ve been contemplating similar themes. Let’s talk about Jellyfish Eyes, which had a limited viewing in North America earlier this year. The film begins with the line, "In this vast universe, we encounter one another miraculously." Why did you decide to start with this message or this line? So this is an homage for the Japanese animation movie Galaxy Express 999. In the first sequence, there’s something exactly like that, a very stupid message. [Laughs] But when I was 17 years old, it looked really mysterious. My target for this movie is kids. Kids doesn&apos;t understand what the sentence means, but it’s just the set-up for something really strange happening. Why did you decide to take the route of live action and CGI for Jellyfish Eyes instead of using animation? I asked him how much was cheap, and he said $300,000. I thought, "Oh this is cheap, because I’ve spent a lot of money to make the animation already, about $2,000,000.” I couldn&apos;t finish it. So we decided to work together, but in the end it has cost a lot of money. What were you able to accomplish with live action and CGI that you couldn&apos;t with animation? The most important thing with live action is the facial expressions. This is more difficult in animation. That’s why with animation, each cut has to be very shocking. Japanese animation techniques aren’t there yet. That’s why, in the end, making facial expressions with live action is very good. Did you consciously make this film at the intersection of so many genres—from action to romance, to fantasy, to sci-fi? Were you afraid of it ever getting overwhelming or trying to accomplish too much? What is the status of the second film? We’ve already finished shooting it. Why was the first Jellyfish Eyes movie a 10-year project overall? Making the movie in CGI was very difficult for me, because we didn&apos;t really have a big budget. I don’t know exactly how they do it for Hollywood movies. Maybe for the Godzilla movie they took two or three years. Part two has over 2,000 cuts after doing the CGI. It’s also difficult to find good fabricators and good CGI people. That’s why it took all this time. What do you most want to convey about natural disaster and how people respond to it? Do you intend to convey hope in the film and in this exhibition? In looking back at the movies I watched as a child, I remember that if the conclusion was too dark or too optimistic, there was something not quite right or realistic. Some movies that conclude optimistically still have dark elements to them. If I was left with that kind of feeling after watching a movie, then I felt that it was more real and connected with my reality. I would watch those movies, and then go back to my daily life processing this. In thinking about why this was more real to me, I realized that on television there are a lot of documentaries about wars, like World War II and the Vietnam War. In everyday life as a child, I was exposed to this type of darker reality. That’s why it makes more sense to me. I wanted to sum up that feeling by creating a hopeful atmosphere, but with a sense of oppression or worry and anxiety at the end. 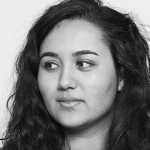 Are certain ideas in the film, whether the F.R.I.E.N.D. Oval, the devices, or the jellyfish eye, intentionally blurring the line between what&apos;s positive and what&apos;s negative, and what&apos;s good and what&apos;s evil? The Oval is essentially one of the F.R.I.E.N.D.s, but he&apos;s also an agent of destruction. Even in this exhibition at Gagosian, it seems like so many things go back and forth from good to bad and bad to good. Are you intentionally always trying to blur that line? The blurring of good and bad is definitely a characteristic of Japanese post-war entertainment. There&apos;s an idea that the winner is good, and if you win, then for the winning side, there’s a happy ending. Post-war Japan had to think, "Ok, we lost, so are we all unhappy?" Japanese entertainment has always been in search for what’s there for the losing side. There are reasons and logic for that side, as well. I used that format for Jellyfish Eyes, too. For example, Oval is summoned by “The Black Cloaked Four” from another dimension or another world. He&apos;s dropped into this new world, but then he&apos;s really surprised and confused about what he’s supposed to do. He&apos;s just walking around and becomes a villain for everyone, because he&apos;s unintentionally destroying everything. It’s very unfortunate for Oval. There’s an idea of, “It’s not good, and it’s not bad; It just happens,” with the disasters. But the kids fighting Oval are using the F.R.I.E.N.D.s, who are similar beings to Oval. There’s no real good or bad on either side. Through that storyline, I think post-war Japanese entertainment is trying to convey or make the audience realize the saga of human beings. So that’s the format I went with. Do you think that telling this story through the eyes of children made the most sense in the end? You said at the New York screening that we have to tell kids to believe in themselves. Do you want this trilogy to inspire children? I definitely made the film with that sort of intention, but my technique in creating it hasn&apos;t really matched what I wanted to convey. I don’t feel like I’m 100% conveying that message. It’s probably more likely that children watching the first film would end up with a lot of questions and confusion about what Oval is, why he came into being, and what happened. I don’t think that it’s a failure in conveying a message, though. The fact that it went a different way is still meaningful, because you’re left with these questions. I read that you cried when you watched Kanye West’s Runway film. You also created the album artwork for Kanye&apos;s Graduation album and have worked with Pharrell on numerous occasions. How have you approached these collaborations, knowing that they may be an entry-point for a younger generation to learn about your art? I myself am the geek who only watched Star Wars, The Walking Dead, and Spielberg movies. I’m obsessed with those things. I’m not really in touch with what music is cool in the real world, but it’s true that people in hip-hop and music culture have liked my work and approached me. The few examples that actually came to fruition are with Kanye West and Pharrell, but it’s actually a mystery to me why they like my work. If I know and can really understand what’s appealing to them, then I can more consciously be working on something interesting. Even if I ask Kanye or Pharrell, they usually say that it’s really colorful, or pop, or nice. I would really like to know and understand more why your readers like my work, to consciously do something and make work that would appeal to them, as well. Right now I’m still exploring what that is.